SAN JOSE, Calif.--(BUSINESS WIRE)--Altierre Corp and Sirqul today announced a strategic global alliance at Retail World Congress in Madrid. The alliance brings together Altierre’s leading Internet of Things (IoT) platform and Electronic Shelf Labels (ESL) with Sirqul’s IoT platform and location-based Edysen technology to give retailers a smart, efficient solution for locating items and shoppers in their stores. By combining Altierre’s wireless in-store IoT platform and ESLs with Sirqul’s patented Edysen location intelligence and IoT platform, retailers can now transform the in-store experience and make individualized promotional offers to shoppers based on their exact indoor location, behavioral insight, and purchase/loyalty history. Sirqul’s groundbreaking technology enables Altierre to deliver an Augmented Reality (AR) application. As a standalone solution or native inside the retailer’s loyalty app, the never seen before functionality allows shoppers to precisely locate specific items in-store while providing recommendations and promotional offers. Retailers will also take advantage of the new AR app to enable associates to pick and pack products for Buy Online and Pickup in Store, Ship from Store, and Curbside Delivery. Sirqul’s technology can monitor shoppers’ with or without an app to view paths in the store, understand dwell times, and provide heat maps of store traffic to optimize staffing, store layouts, and product locations. Retailers are currently experimenting with existing technologies to accomplish these objectives, such as computer vision and video analytics. Sirqul’s solution is less expensive and more effective with a higher degree of accuracy. 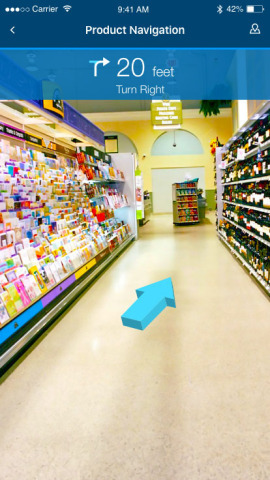 Leveraging AI to analyze shopper’s traffic patterns will help retailers optimize their planogram. Marrying this data with POS data will give retailers a granular picture of shopper activity, which they can leverage to optimize planograms on a store-by-store basis. Sirqul (www.sirqul.com) provides an Engagement-as-a-Service IoT Platform with Smart Mesh network technology to drive engagement, operational efficiency rapid innovation and new revenue streams. At the foundation of Sirqul’s platform are 75 Services, 350 APIs, 3 distinct IoT hardware product offerings, and over 30 customizable native application templates for rapid deployment on a building block approach. Sirqul is – device, protocol and cloud agnostic – fostering an interoperable system for building future-proof solutions for retail, auto, cities, buildings, industrial, entertainment, and more.